On the Wednesday we decided to take advantage of the fact that some of the tourist attractions, and general holiday activities were open and available in mid-August. In the past, because Marion worked at the airport, our trips away always took place in very low season. That's fine from a cost-related point of view, but it did mean that you had to make your own entertainment, and coastal holidays in Scotland are less fun when it gets dark at 6pm and sometimes snows on the beach. Mull at the height of the summer, on the other hand, was a positive cornucopia of things to do. And I've never been one to knock back a cornucopia. 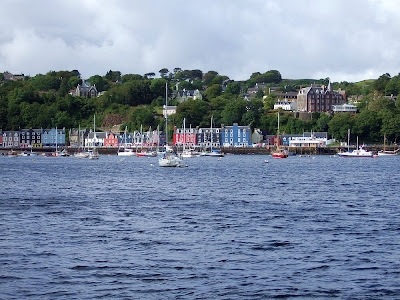 So, we took a boat trip (or an eco-cruise as it was called) from Tobermory. This particular cruise involved a two hour round trip, and dogs were allowed, so that was the clincher. Indeed there was an official ship's dug - a grumpy wee terrier of indeterminate age and breed which wandered round snapping at all the tourist's dugs and generally letting them know who was the boss. Awfy gallus. Molly remained aloof (poodles are water dogs, of course, so there was three quarters of her in her element) but Jorja was definitely suffering from a touch of the mal de mer once we got out the harbour. 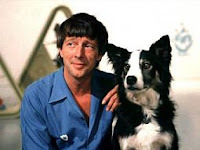 The Wee Black Dug was greenish. The skipper - "everybody calls me Pops" - came out for a moment and said that normally the boat headed up to the fish farm in the bay first, and then pottered about looking for porpoise, gannets, seals and really anything else of interest. 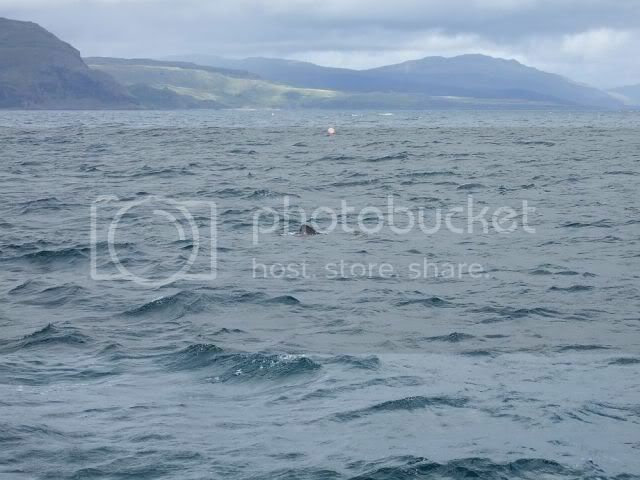 That morning though, he advised, the passengers on the four hour cruise had caught a glimpse of basking sharks a good bit further out, and he thought that if he stepped on the gas we might have time to get out to where they'd been spotted. He would give the punters the option. Did we want to look at wee fish in the farm, or hunt big fish in the sea? All the English speaking folk put their hands up for the shark hunt. All the non English speakers looked somewhat alarmed when the Sula Beag set off like a bat out of hell for open water. And you know what? We found them. Two of them, maybe 12 metres long or so. Doing what basking sharks do - cutting through the water, just below the surface, huge white mouths agape gathering plankton. They were probably about15 yards from the boat at their closest. Pops would hare after them when they moved away, performing what can only be characterised as maritime handbrake turns to bring the boat back alongside one or other of the fish. That manoeuvre causes the sea water to fire up through the sluices, let me tell you. I'm no' sure it improved Jorja's mood either. We could tell the sharks apart by this stage, because the dorsal fin on the smaller one had a white edge - caused by sunburn. Every day's a schoolday, eh? It was a great experience. I know the photo only really shows a rather distant fin, with no idea of scale...but I like it. Oh, and given that I was standing on an impressively swaying deck with my wee point & shoot camera in one hand and Molly's lead in the other, I'm quite proud of it.